Trans-computational membranes 3.0 will continue exploring computational design methods through the use of digital-analogue experimentation, challenging the way we conceive flexibility within the context of spatial re-adaptation as a driver for social change. Time-based dynamic systems will transform the digital–analogue divide through networks of instantaneous spatial deployment creating a symbiotic spatial context that examines new-era demands. The workshop will re-think membrane structures from the micro to macro organization resulting in a habitable prototype. Through the investigation of different scales, tensile structures will primarily be re-adaptive environments, searching for dynamic stability while responding to new spatial necessities. Natural-based models will be challenged through a continuous dialogue between analog and digital experimentation, where material processes and fabrication techniques are incorporated within a digital working methodology, analyzing material behavior from Nano-scale patterns to the production of physical prototypes at 1:1. Students will take part exploring varied modeling and generative design workshops aimed at digital fabrication of textile prototypes. The course will be taught by tutors from the AA and the UEM who specialize in simulation techniques and generative design, being assisted by experts in textile materials as well as tensile structures alongside studio-based design tutorials. A series of lectures will address topics related to dynamic architectural models, adaptive systems and patterning experimentation for spatial deployment. Application The deadline for applications is 1 August 2015. All participants travelling from abroad are responsible for securing any visa required, and are advised to contact their home embassy early. After payment of fees, the AA School can provide a letter confirming participation in the workshop. The AA Visiting School requires a fee of £695 per participant, which includes a £60 Visiting. If you are already a member, the total fee will be reduced automatically by £60 by the online payment system. Fees are non refundable. Roberto Garcia Velez is graduated in Architecture from the European University of Madrid (UEM) and he holds a master in Architecture and Urbanism from the Architectural Association (AADRL), London. PhD candidate at the Polytechnic University of Alicante (UA), focus on self-organization and material computation. Roberto Garcia Velez is currently associate at RGN Architecture Office leading projects in different countries such us Uruguay, Venezuela, Azerbaijan, Argelia, Guinea-Bissau, and United Kingdom. He is co-founder of Ctrl+M and lof design, an architecture practice based in Spain. 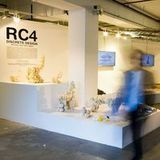 He has been lecturing and attending juries in various universities in Europe His work has been featured widely in ‘Acadia 2012‘(San Francisco), ‘Royal Academy Summer Exhibition‘(London) or ‘Rethinking the Human in Technology Driven Architecture 2011‘ (Crete). Christopher Pierce studied at Virginia Polytechnic Institute and State University and gained a PhD from the University of Edinburgh. Among his recent publications are essays on OMA, ‘From Bauhaus to Our House to Koolhaas: The Office for Metropolitan Architecture (OMA) and Modern American Culture’; Cloud 9, ‘Seven-year Itch: Another Note from Empuriabrava; and Diller Scofidio + Renfro, ‘Threes a Crowd. He formed Mis-Architecture with Chris Matthews in 2000. Christina Dahdaleh is a passionate and enthusiastic Designer. She has graduated recently from the Bartlett School of Architecture (UCL- London) with a Masters in Architecture, under the teaching of Nannette Jackowski and Ricardo de Ostos. She also holds a first class honours in Bachelor Degree in Architecture from the Kent School of Architecture, 2012. She is currently working at MadMDesign (UK) as a member of the research team, collaborating on the development of a flexible 3d printed pavilion, as well as a series of digitally manufactured furniture pieces. Christina has also previously worked in several well renowned architecture offices; RTKL (UK), Guy Holloway architects (UK), Faris and Faris Architects (Jordan) and Jaafar Toukan Architecture (Jordan). She was involved in the production and designing for international clients based in the Middle East, South East Asia and Europe. Christina’s experience also extends into the film and theatre industry. She has worked on several feature films as a wardrobe and set design assistant, the most recent being ‘Rosewater’, a feature directed by John Stewart. Lecturer and Guest Critic in many International Universities and Visiting Professor at Städelschule Frankfurt, ETSAB BarcelonaTECH UPC, UNISS Alghero, Bartlett UCL London and GSD Harvard Graduate School of Design Cambridge. NOTE Any last minute change will be notified and any late cancellation from the lecturers will be covered by another professional of their kind. SCHEDULE Day 1 Wednesday 2nd of September 2015 General Introduction day in school. Opening Ceremony by Sponsors and collaborators, together with representatives of the UEM and AA. Introduction of the first exercises by the course tutors, short presentation in computational tools and simulation methods. Opening lecture by programme director and faculty. Lecture Series - Gilles Retsin Dinner + drinks(not included). Day 3 Friday 4th of September 2015 10:00 and 02:00, Computational tools - Rhino and Grasshopper 2.0 by Adolfo Nadal. Team by team tutorials and technical support by the tutors during the entire working session in the afternoon, aiming to get the first 3d models at the end of the day. The teams will choose its scale of operation so they continue with more support from one of the main tutors. Day 4 Saturday 5th of September 2015 Visit to Madrid Caixa Forum by Herzog & de Meuron and to Reina Sofia Museum by Jean Nouvel. Internal jury at “El Retiro park”. Work session during afternoon, technical and conceptual support by tutors. Day 5 Sunday 6th of September 2015 Visit to ‘Madrid de los Austrias' with lunch in Plaza Mayor (not included). Work session during afternoon. Day 7 Tuesday 8th of September 2015 10:00 and 02:00, Computational tools - Rendering + Animation by Roberto Garcia. The deployment of a one to one textile pavilion will be running in parallel, the students will participate in that process in combination with their personal project, introducing new inputs in the pavilion development.Tutors will be available for discussion and support during the work sessions. Day 9 Thursday 10th of September 2015 Generation of 3d prints and digital renderings of the teams proposals. We will commence the session showing representational tools and rendering techniques, follow up by the constant assistant by technical tutors during the whole session, aiming to get a professional look of the ideas discussed during the workshop. Tutors will be available for discussion and support during the work sessions. Day 10 Friday 11th of September 2015 Continuation of 3d prints and digital renderings of the teams proposals. We will set up the one to one membrane prototypes together with the textile pavilion to be used as a background for the final presentation. Day 11 Saturday 12th of September 2015 Final presentation with guest jurors, together with some of the most relevant Spanish architects of the current scene. Diploma ceremony Keynote lecture - Josep Mias Closing Ceremony - Cocktail at Roca Madrid Gallery - Every participant will receive an AA diploma, certifying their participation in the workshop. Final dinner for guest critiques, students and tutors on a central outdoors location in Madrid (TBC). NOTE: All events will take place in Roca Madrid Galley when a different venue is not specified. Lectures schedule could be modified or exchanged alongside the workshop development. 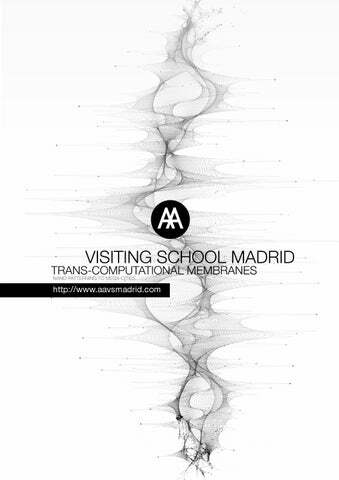 Textile Pavilion produced through digital fabrication, AA Visiting School Madrid 2013.